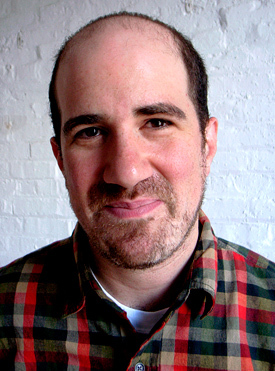 The EyeWriter, Zachary Lieberman with F.A.T, OpenFrameworks, & Graffiti Research Lab This week we are announcing the pairings of artists and technologists for Seven on Seven. Teammates Zachary Lieberman & Bre Pettis are both experienced tinkerers, building functional devices and conceiving new ideas for them. Lieberman's work in augmented reality and Pettis' innovations in 3D printing are examples of how the teammates explore issues related to materialization and representation... Zachary Lieberman is an artist with a simple goal: he wants you surprised. He creates artwork that uses technology in a playful and seamless way to explore the nature of communication and the delicate boundary between the visible and the invisible. He makes performances, installations, and on-line works that investigate gestural input, augmentation of the body, kinetic response and magic. Most recently, he helped create visuals for the facade of the new Ars Electronica Museum, wrote software for an augmented reality card trick, performed by Marco Tempest, and helped develop an open source eye tracker, the eyewriter, to help a paralyzed graffiti artist draw again. In addition to making artistic projects, Lieberman is co-creator of openFrameworks, an open source C++ toolkit for creative coding. He is a professor at Parsons School of Design. In 2010, he was listed in Fast Company's 100 most creative people in Business, and the EyeWriter project was listed in Time magazine's best inventions of 2010. Bre Pettis makes things that make things. Passionate about invention, innovation, and all things DIY, Pettis builds infrastructure for creativity. 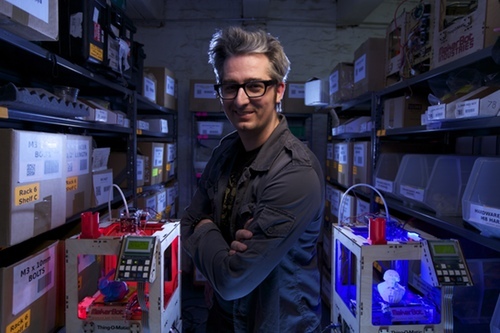 He is a founder of Makerbot, a company that produces robots that make things, a founder of Thingiverse which is a universe of downloadable designs, and a founder of NYCResistor, a hacker collective in Brooklyn. He dreams of manufacturing tools being absurdly common and likely finding a place next to your toaster.